Magik*Magik is a made-to-order orchestra led by Artistic Director Minna Choi. Over the past five years, San Francisco's Magik*Magik has provided orchestral players and composers for a multitude of projects, including studio albums with Death Cab for Cutie, The Dodos and John Vanderslice; live shows with Sting, The Walkmen and Nick Cave and the Bad Seeds; original programs for children at the Stern Grove Festival and Contemporary Jewish Museum; plus film scores, live dance accompaniment, concert performances, and more. Known for their flexibility and ease-of-use, Magik*Magik is comprised of top Bay Area classical freelancers who perform frequently with the Bay Area’s orchestras and are graduates of respected musical institutions including the San Francisco Conservatory, the Juilliard School & the Peabody Conservatory. An ensemble of Magik*Magik players plus a popular recording artist will perform a set at your event. Sets consist of original orchestral settings of music performed by the Magik ensemble and artist of your choosing*, and can vary in length to suit the needs of your event. All Magik shows are unique concert experiences and are completely customizable from ensemble instrumentation and repertoire to collaborating artist. Past performances have included artists such as: Thao, John Vanderslice, Geographer, the Dodos and more. Past venues include: SFMOMA's 75th Anniversary, Stern Grove Festival & Davies After Hours. Base price for a custom Magik performance is $3500 for a string quartet ensemble, plus the cost of the collaborating artist, whose fees vary starting from $1000. 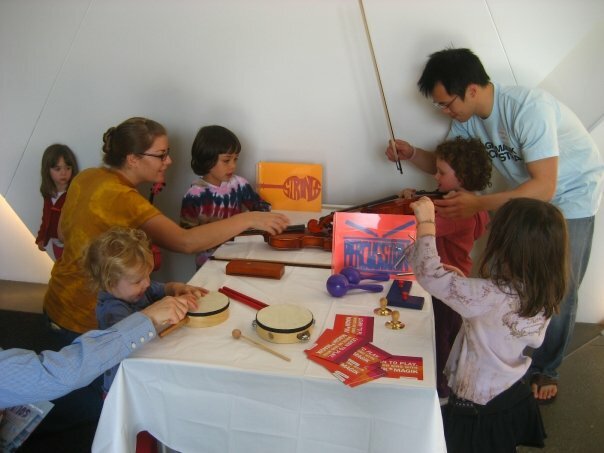 The Magik*Magik Musical Petting Zoo is a collection of instruments representing the four families of the Orchestra for kids (and adults) to try out for themselves. The Zoo is administered by four Zookeepers, who will arrive with the zoo and all necessary equipment including all instruments, signage and mouthpiece disinfectant supplies for an activity well-suited to high-volume events. Base Petting Zoo price is $900 for the first hour. Based on programs designed for the Stern Grove Festival, KIDSConduct is a one-hour program designed to teach up to 60 kids the basics of orchestral conducting. Starting with building and customizing their very own batons, participants will learn musical basics like dynamics and rhythm, and how to guide and shape music-making using their hands and batons. The program concludes when the Magik teachers pick up their instruments and perform under the direction of their newly-minted conductors. Base price for KidsConduct is $1200. If you don't see what you're looking for above or have other ideas about incorporating orchestra into your institution's program offerings, we can collaborate with you to create new performance or education programs to suit your needs. Tailor-made projects start at $1500, depending on the size of the ensemble and length of the engagement. For more information about Magik*Magik and its programs, contact annie@magikmagik.com.